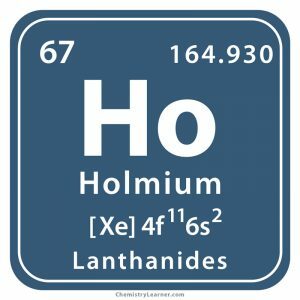 Holmium (pronunciation: HOHL-mee-em) is a silvery metal belonging to the group of lanthanides and represented by the chemical symbol Ho [1, 2]. It has one stable naturally occurring isotope, 165Ho, with a natural abundance of 100% while its most stable radioisotope, 163Ho has a half-life period of 4,570 years . 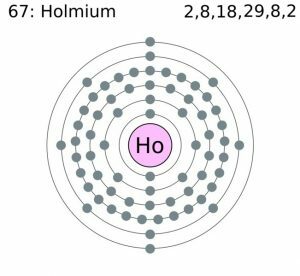 Although Holmium does not freely occur in nature, it is found as a component in several minerals including bastnaesite and monazite [1, 4]. Commercially, it is obtained from monazite, bastnaesite, and xenotime ores through ion exchange and is isolated by calcium reduction of its anhydrous fluoride [1, 4, 5]. While top 3 holmium producing countries include China, Russia, and Malaysia, the top 3 nations with the largest holmium holdings in the world are China, the CIS countries, and the USA . Origin of its Name: It is derived from ‘Holmia’, the Latin name for the Swedish capital Stockholm . 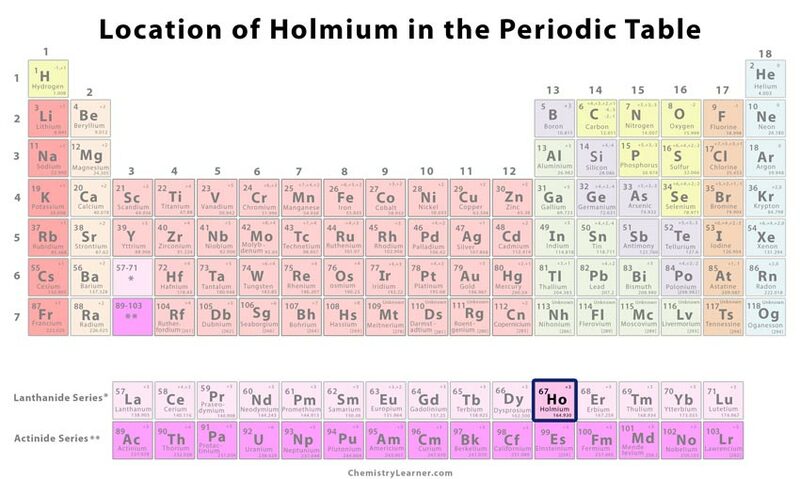 Who discovered it: Holmium was discovered by the Swedish chemist Per Teodor Cleve, and independently by the Swiss chemist Louis Soret along with Marc Delafontaine . In 1878, Louis Soret and Marc Delafontaine while investigating yttrium at Geneva found that it was contaminated with other lanthanoids, observing unexplained spectral lines [1, 4]. 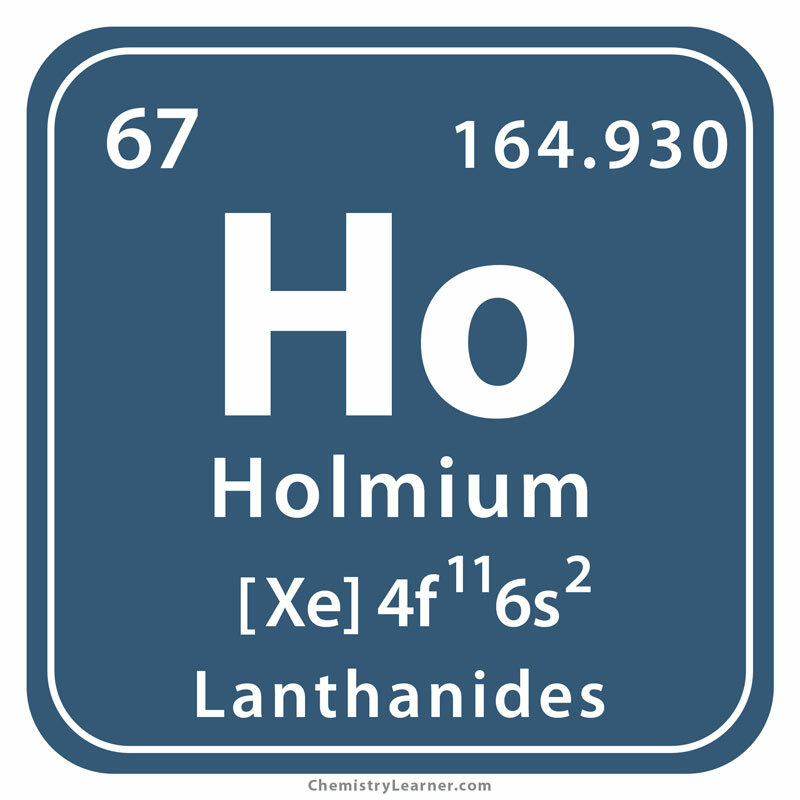 They extracted a new element ‘X’, which is now known as holmium . In that same year, Per Teodor Cleve worked with erbium at Uppsala to discover a brown and a green substance, which he named holmia (holmium oxide) and thulia (thulium oxide) respectively . 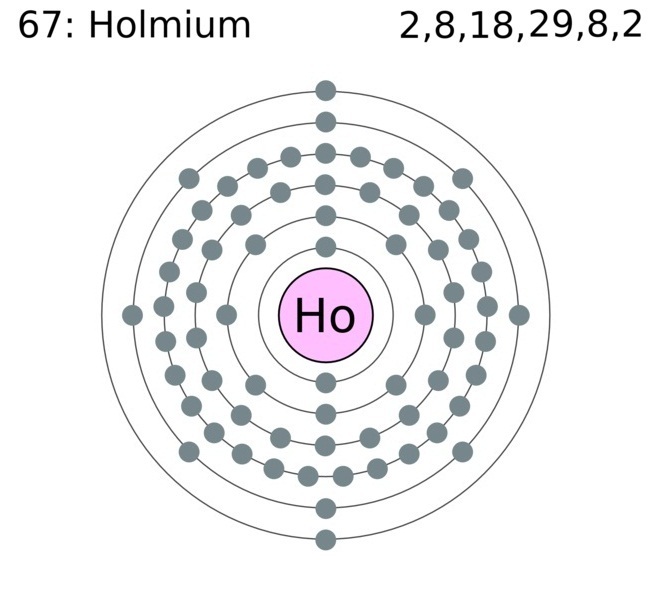 The pure form of holmium was separated by the Swedish botanist Otto Holmberg . Since it is an excellent absorber of neutrons, its isotopes are used in the control rods of nuclear reactors to control fission chain reactions [1, 4]. 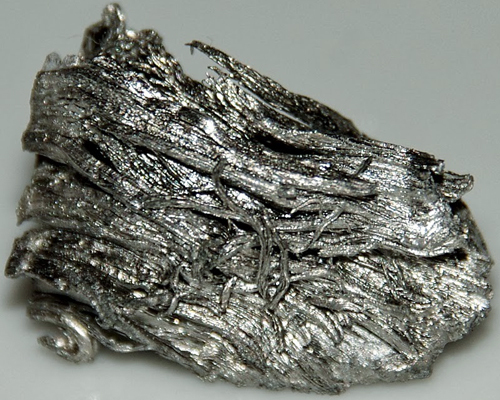 Holmium has special magnetic properties, and so its alloys are used for producing magnets and flux concentrators for high-intensity magnetic fields . Holmium-doped solid-state lasers are used for medical procedures including breaking-up of kidney stones (lithotripsy), and benign prostatic hyperplasia surgeries like prostate enucleation (HoLEP), resection (HoLRP), and ablation (HoLAP) [4, 8]. Holmium oxide or holmia can be used as a red or yellow coloring agent for cubic zirconia and glass . The element 67 is not considered to be harmful because it has low toxicity . However, holmium salts can be toxic if orally consumed, inhaled, or injected in large amounts . Holmium is graphically represented by an image of the coat of arms of Stockholm, the Swedish capital after which the element is named . 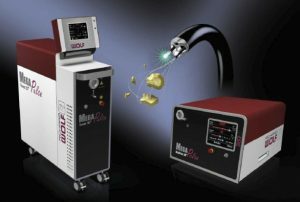 The element quickly oxidizes at high temperatures and in the moist air . The cost of pure holmium is $8.6 per gram and $8600 per kg , but in bulk, its price is $10 per gram .